Tim Rice's first new show for ten years, From Here To Eternity, with music by newcomer Stuart Brayson, co-produced with Lee Menzies, directed by Tamara Harvey, and with book by Bill Oakes, opens in the West End at the Shaftesbury Theatre in October 2013. 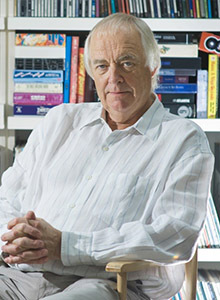 Tim Rice was born in 1944. He began songwriting in 1965 in which year the first song he wrote, ‘That’s My Story’ (tune as well as words) was recorded by a rock group called The Nightshift whose career never recovered. That same year he met fellow budding songwriter Andrew Lloyd Webber whose musical ambitions were in theatre rather than rock or pop. They teamed up and wrote four musicals together from 1965 to 1978. The first, The Likes of Us (1965-66), was performed for the first time in 2005 and became available on CD a mere 40 years after its creation. The other three, Joseph and the Amazing Technicolor Dreamcoat (1968), Jesus Christ Superstar (1969-71) and Evita (1976-78) were more immediate successes. Feeling certain that they could never top this lot, the pair went their separate ways in the early eighties, whereupon ALW immediately topped that lot with Cats. TR then wrote Blondel (1983), a mediaeval romp, with Stephen Oliver, which ran for a year in London. This was followed in 1986 by Chess, in collaboration with ABBA’s Björn Ulvaeus and Benny Andersson. Chess had a healthy run in the West End but flopped on Broadway in 1988, the New York Times bloke (since replaced) being particularly forceful in his disapproval. There have been countless productions worldwide since then, with wide variations in quality and indeed storyline. A notable recent production was in concert at London’s Royal Albert Hall in 2008 starring Josh Groban, Idina Menzel, Adam Pascal and Marti Pellow. In 1989 Tim translated the famous French musical Starmania (by Michel Berger and Luc Plamondon) into English, which merely resulted in a hit album – in France. In the 1990s he worked primarily and happily with the Disney empire, contributing lyrics to the movies Aladdin (music Alan Menken) and The Lion King (music Elton John and Hans Zimmer) and to the stage shows Beauty and the Beast and King David (both Alan Menken), The Lion King and Aida (both Sir Elton). Between Disney commitments he wrote the words for Sir Cliff Richard’s theatrical blockbuster Heathcliff (music John Farrar), which toured the UK in 1995-96. For Dreamworks, he and Sir Elton joined forces yet again to write the score for the 2000 animated film The Road to El Dorado. In early 2011 Tim contributed four new lyrics to music by his old partner Andrew Lloyd Webber for Andrew's new production of The Wizard of Oz at the London Palladium. The show ran there for over year and then moved on to Toronto. He has won a variety of awards, mainly for the wrong things, or for simply turning up. These include a Star on Hollywood’s Walk of Fame, three Oscars, four Tonys, five or six Grammys and 13 Ivor Novellos. He is a former president of the Marylebone Cricket Club and was chairman of the UK charitable Foundation for Sport and the Arts for the entire 21 years of its existence (1991-2012). Tim lives in London, Cornwall and on the motorway between the two, has three children, his own cricket team and a knighthood. The first volume of his autobiography, Oh What a Circus, was published in September 1999. If his publishers ask, he is currently working on part 2, due out five years ago.